A loyal Yamaha rider – and later Yamaha Motor Europe employee - in the FIM world championships from 1968 until his retirement in 1975, Kent Andersson not only brought Yamaha two 125cc Grand Prix titles but was also notable for being the only world champion to emerge from Sweden. A fast and consistent small capacity rider, Andersson came to the attention of the factory team after finishing as 250cc vice-champion on privateer machinery, an over the counter TD2, in 1969 with two victories. Despite four further attempts the multi-national champion would not fulfil his ambition in the quarter-litre class in an era where riders regularly competed in two-three or even four different races at one event. It was with the 125cc twin-cylinder 0W15 that Andersson really found his stride and just three seasons after joining the works squad he took ten victories in two years (1973 and 1974) to help Yamaha obliterate the competition. Andersson – who raced with distinctive white leathers several years before Dutchman Wil Hartog made the shade fashionable – was Yamaha’s third 125cc number one and climbed atop the FIM podium five years after Phil Read in 1968. The Swede would also be the last world champion for the company in the series. 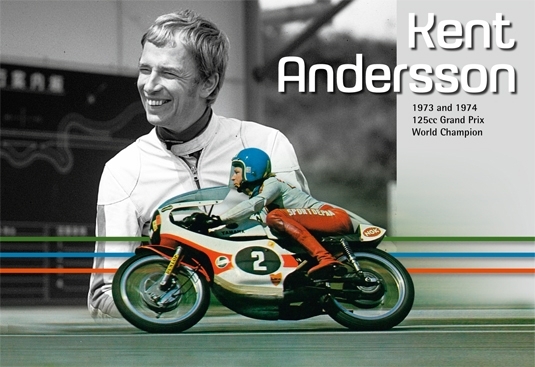 Andersson stepped away from the sport as a full-time professional in the mid-1970s but decided to enter the Swedish Supermono Championship in 1995 that he even won, at the age of 53. He also continued to race exhibition meetings and was a key figure in the Yamaha Classic Racing Team’s activities and demonstrations around the world in recent years. He remained close to the sport and would often take-on media roles for coverage of MotoGP in his native homeland. He passed away in 2006 at the age of 64.